• There are 180 rooms and suites. • Grand restaurant, the Rotisserie des Chevalliers pizzeria, the Chesa al Parc restaurant, the Sunny bar and the Panopy bar. • Meeting rooms, an indoor pool, a spa center and a health club. • Located just above the historic center of St Moritz dorf. • 1840: Opening of the small « Pension Faller » located in an Engadine farmhouse. • 1856: Johannes Badrutt acquires Pension Faller. • 1860: Extension of the Hotel. • 1886: Extension of the Hotel through the construction of the Western part (Westkulm) under the architect Nicolaus Hartmann sen.
• 1889: Death of Johannes Badrutt. 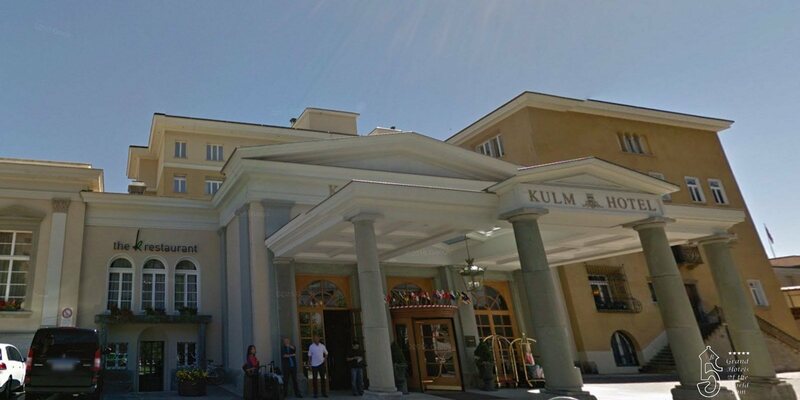 • 1892: Son Caspar Badrutt leaves the Kulm Hotel and builds the Palace Hotel. • 1911: Extension of the Kulm under architect Nicolaus Hartmann jun. • 1928: Olympic Winter Games. • 1935: Anton Robert Badrutt (grandson of Johannes Baddrutt) becomes General Manager of the Hotel. • 1940: Reopening of the Kulm. • 1948: Olympic Winter Games. • 1956: Acquisition of the Hotel Kulm and the Hotel Carlton by Albert Ernst von Pfyffer, (owner of the Palace Hotel in Lucerne). • 1968: Starvos Niarchos is part of a group, Grandhotels Engadinerkulm that buys the Hotel preventing a takeover of the Hotel by Club Mediterannée. (Club Mediterannée had just bought 2 Hotels in St Moritz Bad and also wanted to buy the Kulm, the Carlton and the Hotel Chanatrella). • 1971: Sale of the Hotel Carlton. • 2004 Mai 1: Acquisition of the Grand Hotel Kronenhof.